Mondays: Mod Mondays: $1 off Mod Project pints all day. Improve Twice! Happy Hour Yoga and a Pint. $10. 5:30p. Please bring your own mat. (yoga first, then beer). Tuesdays: Token Tuesdays: All Day. Buy a pint, get a token to donate $1 towards a monthly charity. Thursday Nights: Live Music every Thursday from 5-7. Enjoy hand-crafted specials from The Container of Food. Mainline pints are only $3! Saturdays: Open 11:00am - 7:00pm. $1 off Growler and Crowler fills. Sundays: Open noon - 6:00pm. 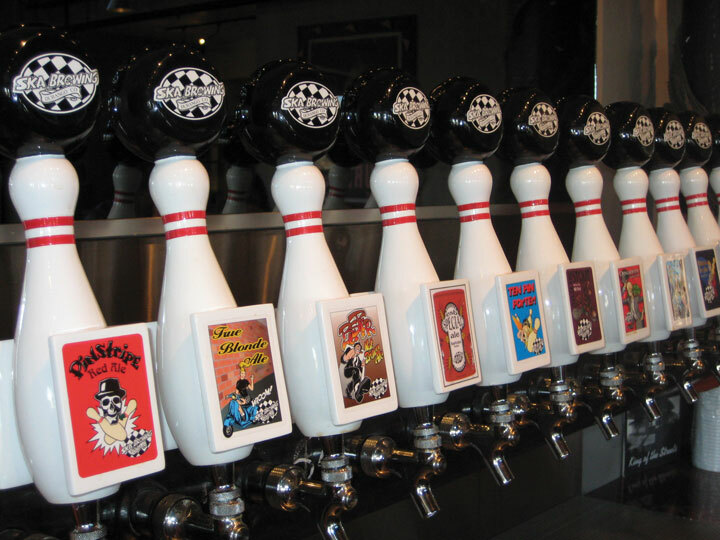 Swag Sundays: Purchase or wear your favorite Ska attire and receive $1 off your first pint. $1 off Crowler & Growler fills. Don't forget to check www.skabrewing.com for any other special events that may be coming up at the brewery—or events we'll be pouring at in Durango and around the state. And check out The Container of Food Menu! Welcome to the evolution of eating at Ska Brewing World Headquarters. To us, eating responsibly means eating well. Eating fresh. Eating local when possible. And of course, eating while you enjoy fresh craft beer right from the source. The Container of Food, built from re-purposed shipping containers and located at Ska Brewing World Headquarters, serves hand-crafted brick oven pizzas and gourmet sandwiches, salads and snacks, along with sweets and kids options. It's a modern-day tasting room experience with a casual food truck culture. When you're here, grab a seat anywhere you'd like – join the community – make new friends. You order your food at the Container counter and order your beer at the bar. We hope you indulge in the many flavors offered here! house-ground beef finished on spent grain from the brewery. Ska's flavor-packed beers can be found in Jeremy's cooking too: don't miss the Steel Toe Stout barbecue sauce or the Steel Toe (Milk) Stout Brownie! We are open Monday-Friday 11:00am - 8:00pm, Saturday 11:00am - 7:00pm and Sunday noon - 6:00pm. Find our Container Menu. A tour of our fantastical 100% wind-powered brew fortress is pretty simple: We show you around the place, tell some stories & feed you the freshest craft suds in the land. Oh, and there’s a beer garden too and delicious food from The Container of Food. FREE TOURS Monday through Friday at 4:00pm.